Spotted last year when she left ADM Kiel for Nobiskrug, the 73m superyacht project 423 left her building shed yesterday under her definitive name, Odessa II. Odessa II has an exterior design by Focus Yacht Design and an interior by H2 Yacht Design. 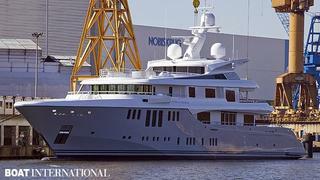 The london-based design office had already worked with the owners on their previous yacht. For this new one, the décor is described as a New Hampton style and accommodates 12 guests in six cabins. Odessa II will be delivered this summer.